Come Out and Support Panther Basketball! 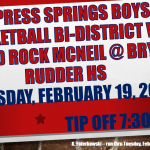 The Panthers will battle McNeil HS at Rudder High School in Bryan, TX on Tuesday, February 19th at 7:30 pm. 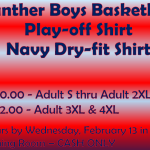 Panthers News · Feb 13 Boys Basketball Playoff Shirts! Purchase your 2019 Boys Basketball Playoff shirt Today! Help support and congratulate our Co-District Champions!